Known locally as the “fiocchi di luce” this translates as flakes of light. This is referring to the snow that surrounds the small town in the heart of the Veneto mountains in the Alpine foothills. 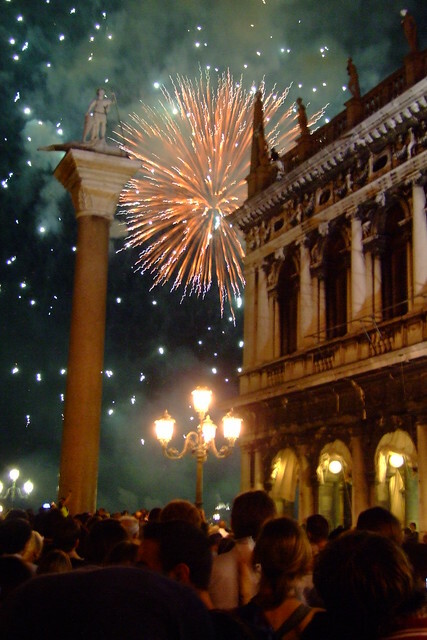 The pyromusical extravaganza is set to light up the skies and return once again for the 12th edition of the largest annual firework shows in the Veneto region of Italy. Held at the Airport Romeo Sartori over the three nights there is a mixture of music and entertainment along with some extraordinary musical pyrotechnics to end the evening with a bang. All the three days have different themes, with this year’s theme being “Enchantment – Ode to the woods”. This is from a time when the local forest was nearly lost following devastating weather to hit the region. Life, nature, respect, and commitment is the way forward to show how important the mountains and the plateau are to everyone. “Shoots” – this is a tale of the life that still exists in the woods after everything may seem destroyed. Saturday 16th February – 16:00 – 22:00 – Airport Romeo Sartori “Roots” – the bond that unites the land and all its inhabitants. “Branches” – a message to the skies and the hope of rebirth in the forest to make it a place that once again everyone knows and loves. Following the tradition, there will be three highly qualified companies of different nationalities participating in the programme. The companies compete amongst themselves showing the best of their work to the international audience that attends the event. Be captivated by the extraordinary variety of the musical firework displays on each of the evenings. The music for the show is chosen by both the organisers of the event and the participants making sure that it keeps in with the theme, culture, and tradition of the nation. Asiago fireworks are not to be missed, with the event taking place on the weekend after Valentine’s day why not treat a loved one to a magical weekend away in the beautiful mountains, made more memorable by one of the many unique events in Vicenza, Italy. There is plenty to see and do all throughout the event but can be quite busy so make sure that you get there early to get a good viewing spot. Also, the weather can be on the chilly side this time of year so make sure that you wrap up warm. In the mid 16th century, Venice was besieged by yet another outbreak of the plague. The Bubonic Plague or Black Death took the lives of more than 50,000 Venetians between 1575 – 1576, which when you consider that the total population at the time was only 160,000, meant that 1 in 3 died of this dreadful disease which even to this day is classified as a bio-terrorist threat. In 1576, the most serene Republic of Venice’s Senate agreed to erect a church to Christ as a plea for help. The Church of the Most Holy Redeemer (Il Redentore) was erected. By July 1577, the area was officially declared plague free and it was decided that in celebration of the deliverance from certain death, each year, there was to be a Fiesta and of course a church service. The Redentore is an authentic, age-old, Venetian event which is very close to the hearts of the people of Venice. On the Saturday, the evening before the service of thanks, at around 7pm, the 333 metre Ponte Votivo is opened up and the people go to the church for the Eucharist at around 7.30 and the blessing of the event and the people. There are boats and barges packed with people, which moor alongside each other to share the music, fun and laughter with large groups of family and friends. The vessels in the harbour are all richly decorated with pretty garlands, flowers and lights. The beautiful pyrotechnics begin at around 10.00pm on St Marks Basin under the control of the fantastic Parente Fireworks. The fireworks are set up on 35 floating pontoons over a distance of around 600 metres in an unusual cross shape. 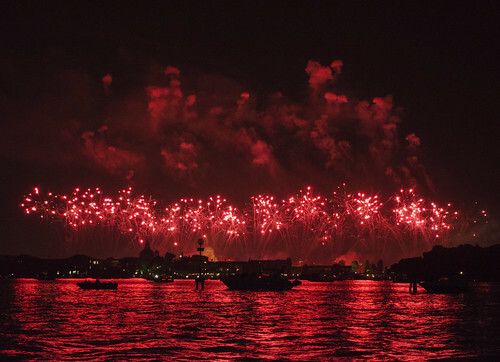 The display lasts between 45 minutes – 1 hour as a general rule and afterwards, the younger contingent of the 100,000 people strong crowd of spectators go off to the Venice Lido where they await dawn and the sunrise. It is another age old tradition, which like a number of other festivals has been around for many hundreds of years and will continue to amaze young and old alike for generations to come.